Fresh Sound Records has been reissuing some jazz soundtrack albums on CD. Let's check them out. 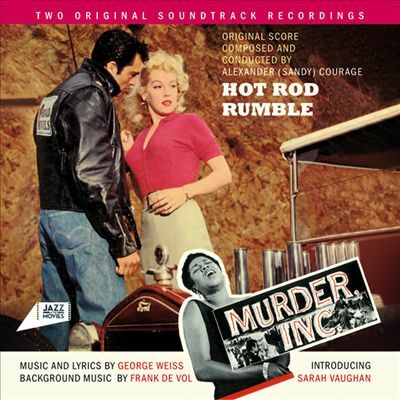 The 309th Soundtrack of the Week is Alexander Courage's music for Hot Rod Rumble and Frank De Vol and George Weiss's score for Murder Inc., both on one disc. This music for Hot Rod Rumble is awesome. Most of the driving material—"Main Title", "Dented Fender", "Chicken Race", "Night Chase" and "End Title"—has an impressively menacing tone. Overall there's a West Coast Jazz meets Ellington kind of sound, I guess, alternatingly with bluesy stuff and teenage rock and roll type material in the same vein as Mancini's Touch of Evil radio music . There are some great players on this record: Pete Candoli, Maynard Ferguson, Frank Rosolino, George Roberts, Bud Shank, Barney Kessel and Shelly Manne among others. There's a Gerald Fried on oboe as well, most likely the same Gerald Fried who also composed many a fine score for film and television of the same period. Murder Inc. kicks off with a main title theme by Frank De Vol that's following the path of Elmer Bernstein's hugely influential The Man with the Golden Arm score. Most of the other Frank De Vol cues are closer to dramatic underscore than jazz, though the main title theme reappears in "Murder Merchants March". "Brownsville Bounce" is a cheerfully swinging tune, most likely source music. The most interesting feature of this record is the two tracks with Sarah Vaughan singing. George Weiss's "The Awakening" is a lovely song that Vaughan nails. She comes back for "Fan My Brow", a lighthearted ditty that benefits enormously from Vaughan's amazing voice. "The Awakening" is the real keeper here, however. It has depth and emotion beyond the other cuts on this record. Finally there's one more George Weiss song, the somewhat grating "Hey! Mister", which must have been for a floor show in a night club scene. "Hey! Mister, Hey! Mister / I want to be your baby sister! / Come on, come on, come on / Won't you baby me?" Send in the murderers.